Summer is officially here and that means one thing: popsicles. But make that boozy popsicles, because we can’t think of anything more party-worthy than that. If you don’t know about boozy popsicles, consider this a guide to everything you need to know about this summer’s options. It turns out that not all boozy popsicles are created equally (with equal amounts of booze, that is), so you’re really going to need this when navigating the freezer aisle at your liquor store. The first thing you should know about boozy popsicles is that some of them actually aren’t accessible in stores around the country, but you can get them online, so don’t worry. Really, not worrying is the number one rule when it comes to popsicles infused with alcohol, because what could go wrong? They’re basically the most perfect summer treat to eat while laying by the pool, reading your summer book. Or you could take them to the park in a cooler and have a perfect picnic. If you happen to want that picnic to get a little rowdy, that could happen too, since some of these popsicles have pretty high ABVs — that’s alcohol by volume. If you’re hoping to choose the boozy popsicle that will give you the most bang for your buck, here’s what you need to know. At 15% ABV, this popsicle’s alcohol content is higher than most wines’. They’ll go down easy, but keep in mind that these are super boozy popsicles. They currently come in six flavors, including Moscow Mule, Caribbean Breeze, and more. They’re sold in various locations in Las Vegas and Miami, but you can order an eight-pack online for $100 — and you’ll even get discounted UPS Next Day Air shipping. What could be better? SnöBar sells alcohol-infused popsicles all over South Carolina, but you can also purchase them online, and you may want to. While it’s hard to find the ABV info on SnöBar’s site, over email the proprietor told HG that the popsicles contain between 12.8% and 17.9% ABV, depending on the flavor choice. Those flavors include margarita, cosmo, and mojito, and you can buy a case of 24 popsicles for $100. Considering that SnöBar popsicles have the same volume (100 mL) and similar ABV as Buzz Pops, that sounds like a steal. As you can tell from the name, Skinny Freezers are not just about getting you sloshed with a slushy-type treat. They boast a 100-calorie count per popsicle. The actual best part of these popsicles, though, is that they’re sold at Costco, and they’re also available online through Hi-Time Wine Cellars. You will also soon be able to buy them at the west coast chain Total Wine. The Skinny Freezers come in Appletini, Cosmopolitan, Lemon Drop, and Watermelon Lemonade flavors. If they sound delicious already, just wait till you hear the price: a 12-pack goes for $30 from Hi-Time. Of course, the Skinny Freezers are much smaller than the Buzz Pops, but they’ll definitely cool you down. Fruta Pop calls their alcohol-infused popsicles “poptails,” which is adorable and also kind of confusing if you think about it for too long. 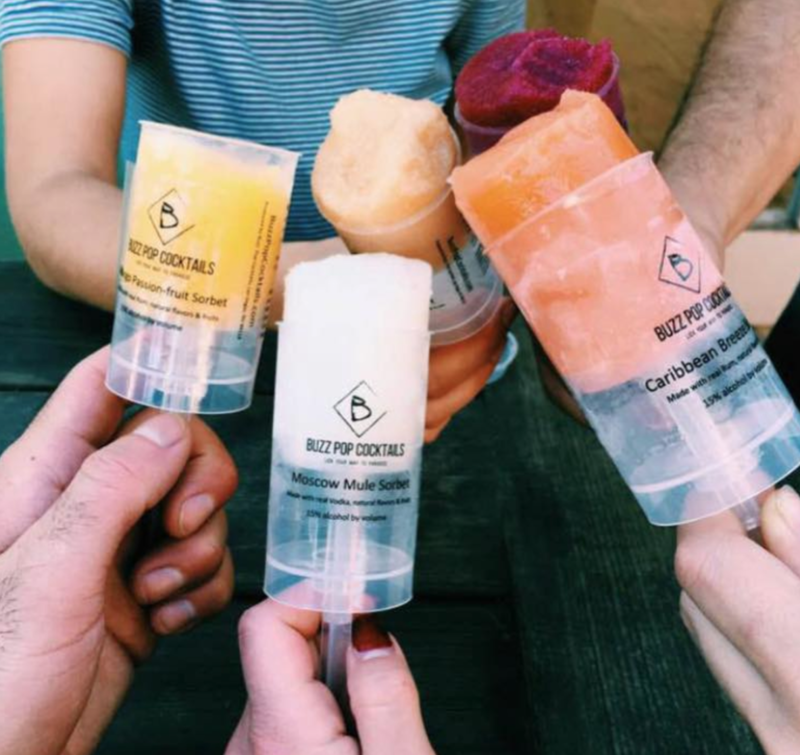 While they say their popsicles usually contain 5% ABV, the actual percentage of alcohol per volume can vary. For instance, the Watermelon Margarita POPs are 5% ABV, while the Sangria POPs are under 5%. But, then again, those flavors sound so amazing, does it even matter? The other flavors include Piña Colada, Coconut Rosé, Cranberry Mojito, and more. You can order packs containing 12, 24, or 36 popsicles from Fruta Pop’s online store. The prices start at $60 per case, but be forewarned that the overnight shipping will probably cost you around $30 added to the total. Really, it seems like you can’t go wrong with any of these options. Alcohol + popsicle = summer fun, it’s just that simple.